Another update to the app! 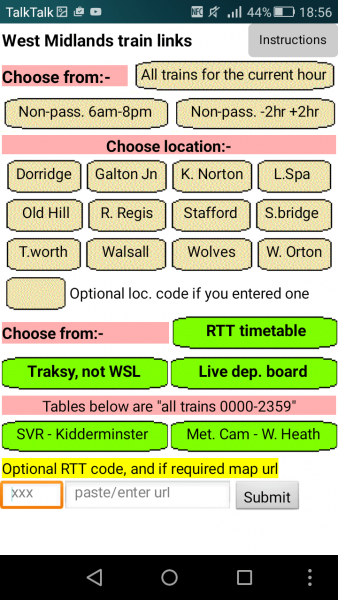 6 days later and much thinking and editing, the app now has a box to enter a location code and map url of your choice! It’s getting better, but not really finished yet. I will have to amend the “instructions” to include the new feature but need some time to mess around using it to try and find any problems. I have updated the .apk file to be the new version. This entry was posted in Computers, Uncategorized on March 28, 2017 by Sharpo. 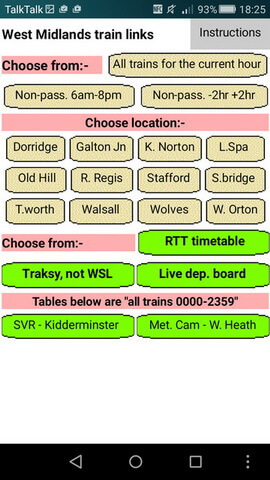 I’ve redesigned the appearance of the main screen and added links to Traksy maps and National Rail live departure boards. I was using it yesterday when I went to Longbridge and everything seemed OK. I do have further ideas though…. Watch this space! This entry was posted in Computers on March 22, 2017 by Sharpo. This entry was posted in Computers on March 16, 2017 by Sharpo. See more recent post, as the app has been updated!! There are 3 options, based on how I normally use it in my browser. 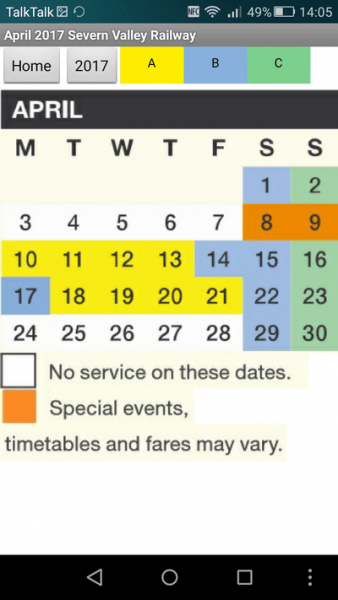 All trains for the current hour – handy if I’m briefly at a station or catching a train, then non-passenger 6am – 8pm, which I would probably check at the start of a day, then finally non-passenger over a 4 hour period – useful if I am waiting to see some freights. 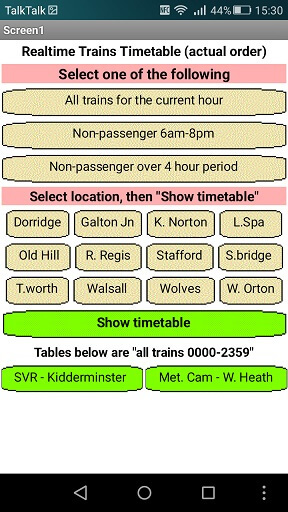 All options are set to actual times, not WTT. If you wish to try it, I have created an .apk file which you can download and install on your mobile – Android only though! 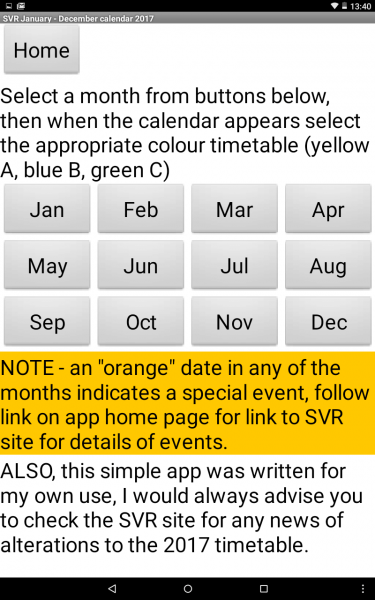 Follow this link to download the app file. 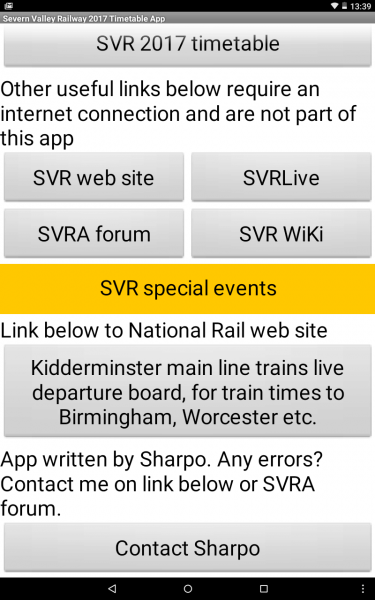 SVR 2015 Spring Steam Gala timetable – Android app. Yes, another app. 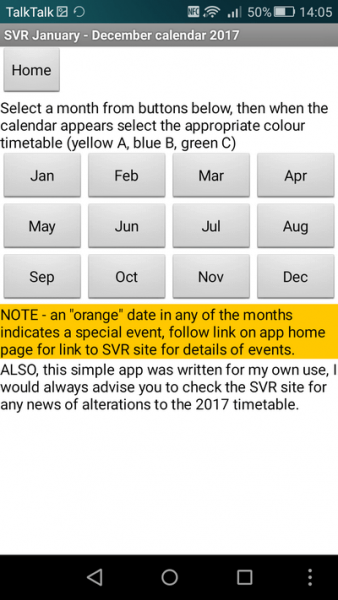 I’ve copied the gala timetable from the svr.co.uk site and put it in a simple android app. 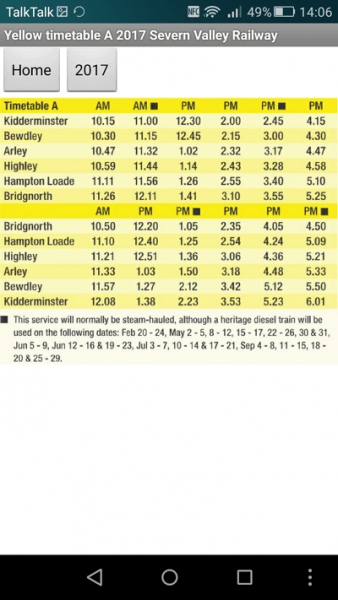 It also includes the loco allocations as at 15/03/15. Don’t blame me if there are any changes since then!! EDIT – it worked well, only downloaded 23 times but seems it was appreciated according to comments people sent me. This entry was posted in Computers on March 18, 2015 by Sharpo. It was published 2 weeks ago and has been downloaded 52 times. As yet, nobody has pointed out any mistakes, so I am pleased I must’ve got it right. If you want to try it, the link is in the previous post. This entry was posted in Computers on March 3, 2015 by Sharpo. 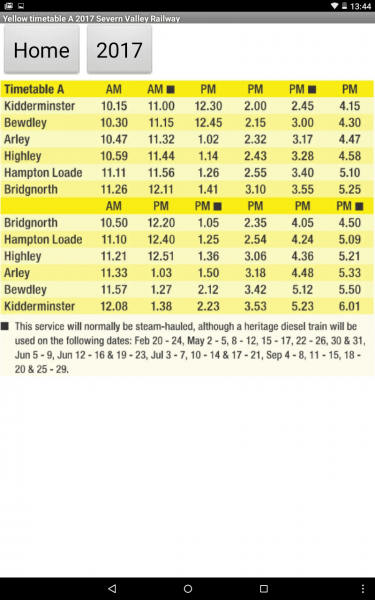 Severn Valley Railway 2015 Timetable Android app. I’ve completed the app for 2015. 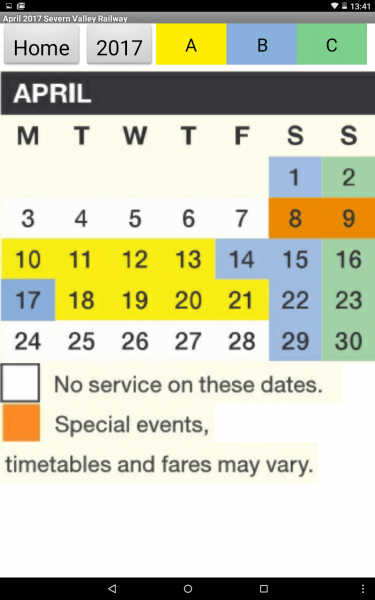 It will give you the times for all the regular service trains on the SVR for 2015. 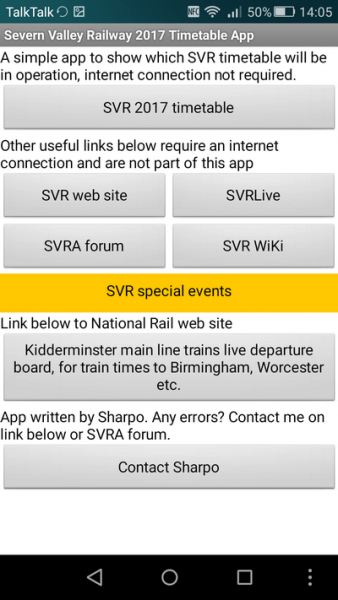 The timetable app, once installed, does not require the internet to give you the timetables, but links to the SVRA, forum, SVRwiki etc. do. It works on my 2 Huawei smartphones and my 7″ Asus & Samsung notebooks. 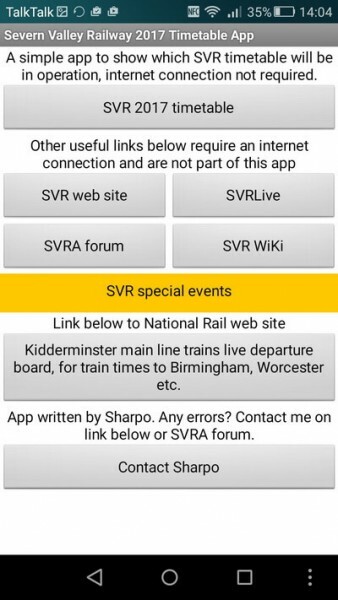 Admittedly that does not mean it will work perfectly on everything, but some positive comments from the SVRA forum mean it works for other people as well. It can be downloaded from Google play store – and is FREE! Must be worth a try…….. This entry was posted in Computers on February 18, 2015 by Sharpo.